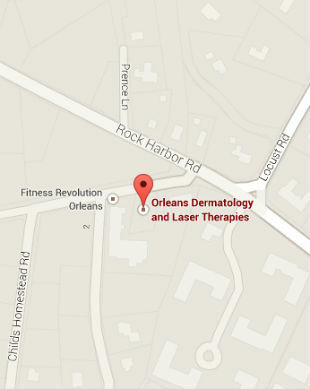 Orleans Dermatology and Laser Therapies - Serving the folks of Orleans and the surrounding Cape Cod region! * Your privacy is our utmost concern. Even though our company uses a secure, encrypted email service, your email account most likely does not. Your electronic communication has a possibility to be intercepted and read by a third party. Don't email information such as your birthday, social security number, or any private medical information. We will not diagnose your condition via email. Communication via email cannot replace the professional relationship we will foster in person. Many Thanks! Orleans Dermatology & Laser Therapies is committed to providing readily accessible high quality skin care to the Cape community. We serve the folks of Orleans and the surrounding Cape Cod region. Optimal current and appropriate treatment options will be made available to promote the ongoing health of our patients. We provide therapeutic methods that can often reduce emotional and physical trauma, preventing scarring. It is our hope that you will actually enjoy coming to our office and feel very safe in our hands. "As patients of Dr. Miriam Kravitz, let it be said that being greeted and treated by warm friendly staff, especially Medical Assistant Molly, is truly appreciated. Thank you for the cleanliness and professionalism of the practice. Dr. Kravitz is able to manage her time in such a way that she can focus on us unhurried and is never in a rush out the door. She is very thorough when in the examining room. She even pops in when we are there for other treatments offered at her office. Dr. Kravitz is ahead of the curve in the dermatological field and the advancement of skin care treatments; she is a model to the future of Cape Cod dermatology."